Audio Northwest is comprised of a small group of people who care about what they do: Kristen Boyd, Layne Drew, Katie Morrison, and owner Jesse Peterson. 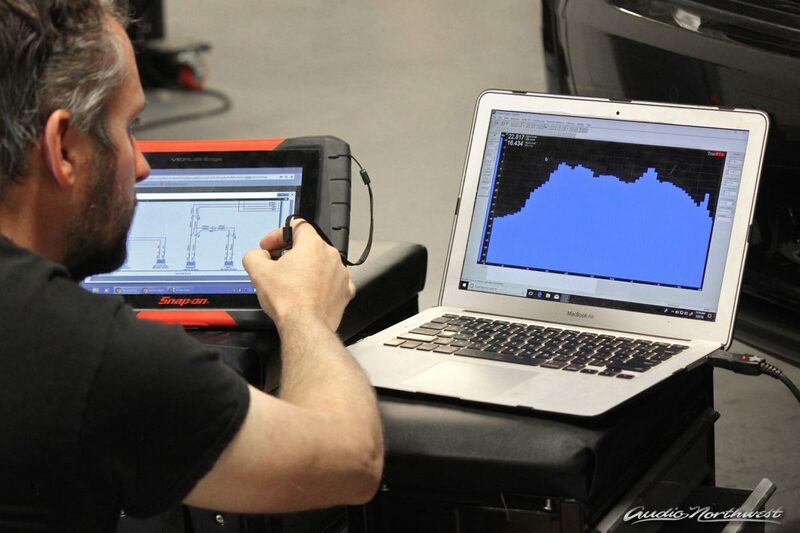 Their expertise is in car audio but their services do not stop there. “We have the manufacturing skills, materials, and tools so that we can do really cool things that are traditionally not seen in car stereo shops,” explains Jesse. For those of us not technologically savvy, Audio Northwest is a great resource. “Sometimes people who are not fond of electronics come in with radios with a ton of buttons and Bluetooth in their car that they are still not using, and we help them learn how to use it,” shares Kristen. She goes on to add that the team likes introducing radios with a simpler interface, minimal buttons and a big easy-to-use touch screen for these particular customers. Aside from complex stereos and luxury items like remote start, Audio Northwest can do lightning upgrades from standard halogen bulbs to bright LED and HID bulbs that put out three times the amount of light. They also clean off foggy headlights. Among all of these other things, Jesse has even had customers come to him to change their clocks for daylight savings time. Sometimes it’s the little things that make the most difference. Once the cause of the problem is discovered, Audio Northwest will typically be able to fix it, unless it is something like swapping out an engine. The team draws the line at anything that starts to get their hands, tools, or shop greasy. Possibly the most impressive thing about the work done at Audio Northwest is their craftsmanship. “We can make a big speaker anywhere in your vehicle and make it look like it belongs there,” explains Kristen. Audio Northwest is able to do such detail oriented and high-quality work with the use of advanced technology like laser cutters and a CNC router, a highly intelligent robotic machine controlled by computer and used to cut shapes out of different materials. 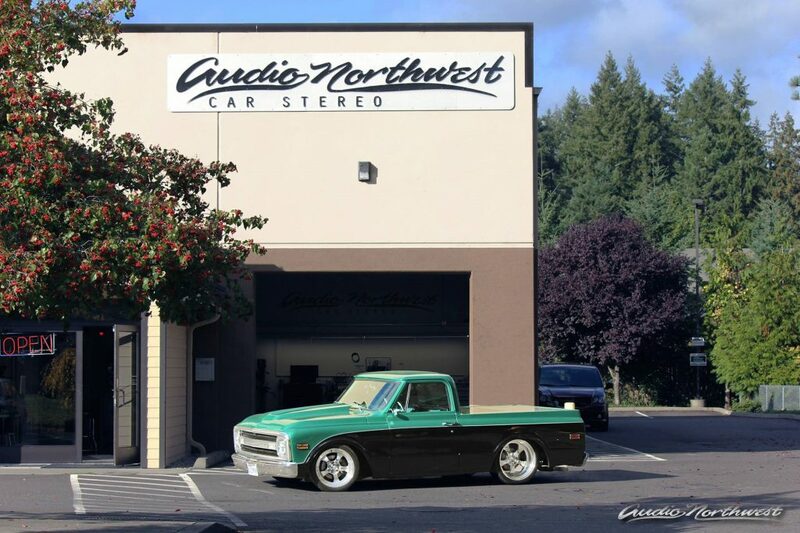 The CNC router Audio Northwest uses was hand built at their shop. The crew at Audio Northwest are always striving to make their work better. One of the ways they do this is by creating tools that enhance their work flow. Their guiding question on tool design, as Jesse shares, is: “How can we make this better?” Some of the tools are seemingly simple like door panel holders, or more complex items like an intricate jig to help organize wires. Some of these tools are now being used in other states, Canada and Australia. The team at Audio Northwest love interesting projects that allow them to explore their creativity, skills, and solve problems. Jesse’s personal favorites being ones where they can hide everything that’s in the car and make it sound awesome. Regardless of the job, the team at Audio Northwest will cater to your unique needs and take the time to do the job right. “These days, every car is unique. Adapting to an ever-changing automotive industry means investing in advanced technology and specialized equipment. For one client, we were able to measure and analyze the frequency spectrum of each audio signal, in real time (don’t try this at home). In other words, there is no ‘one size fits all’ solution and the only way we can tell is by measuring, which gives us the ability to provide consistent high-quality results,” explains the team at Audio Northwest. Bring your requests and questions into Audio Northwest. Chances are if it is electrical they can do it. 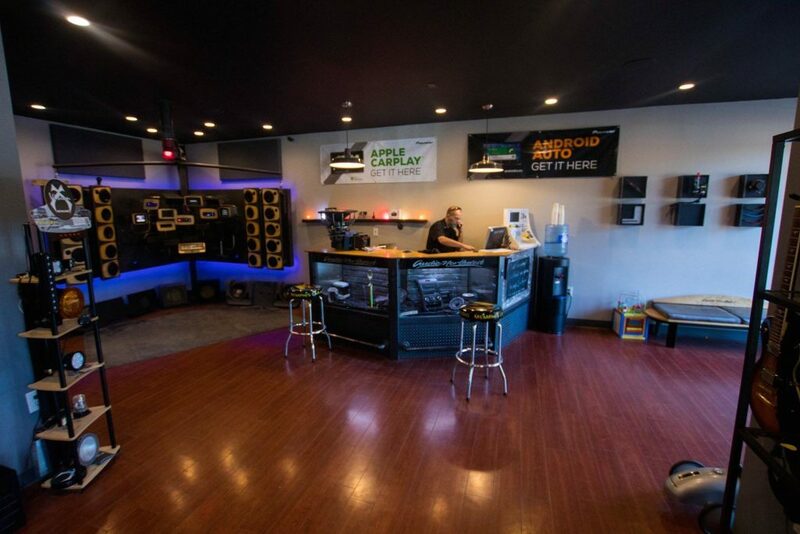 Audio Northwest is located at 4708 Pacific Avenue SE in Lacey. For more information, give them a call at 360-786-9512 or visit their website.